When Grace was just an infant she caught an infection and spiked a high fever. Grace and her mother didn’t receive any medical care…they were just sent home with some glucose. Within three months Grace’s head started rocking from side to side. She didn’t have any control of her neck, and soon her entire body shook. She developed cerebral palsy. The sad reality is that this condition cannot be cured. However, the right therapy and training for activities of daily living, and the right equipment can be life-changing! In fact, it can transform a child like Grace’s life from one of isolation, ridicule and extremely limited functioning to one of joy, ability, friendships and thriving! 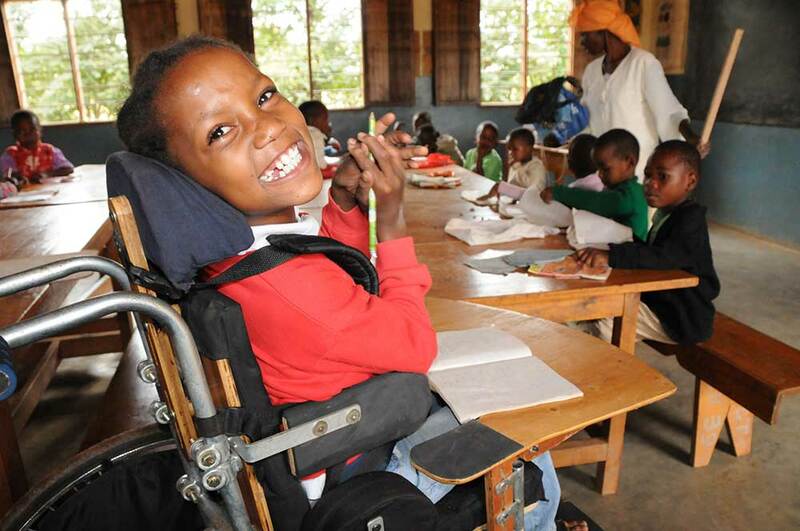 And…of critical importance, treatment allows children like Grace to go to school. Her mother initially took her to physiotherapy, but soon couldn’t afford the ongoing treatment or even the transportation to the hospital. Then someone like you stepped in and gave her the care she needed. Recently, Grace has also received a wheelchair from CCBRT. “I like going to school,” Grace said. Her hearty laughter is proof. Her newly-formed friendships are proof. Her vocabulary is proof. Thank you for loving a child like Grace.